Nepal India Complete Buddhist Circuit Tour 12 days 11 nights is a tour designed for those who want to follow the footsteps of Lord Buddha. You will spend 6 days in Nepal, and 6 days in India. Kushinagar where I shall pass into “Mahaparinirvana”, means: ultimate state of Nirvana (everlasting, highest peace and happiness) entered by an Awakened Being (Buddha) or “arhat” at the moment of physical death. Eyes On Nepal offers this complete “Nepal – India Buddhist circuit tour 12 days 11 nights” to our valuable guests to understand and to feel the Buddhism. Let’s follow the footsteps of the Great Shakyamuni Buddha. Why Nepal India Complete Buddhist Circuit Tour? We combine Kathmandu City Tours, Pokhara City Tours, and most importantly we let you follow the footsteps of Great Shakyamuni Buddha to Lumbini (where the Buddha was born), Bodh Gaya(where the Buddha attained the enlightenment), Sarnath (where the Buddha gave his first speech) and Kushinagar where the Buddha died. The tour will start in Nepal and ends in India. In Nepal: You will visit Kathmandu, Pokhara & Lumbini. In India: You will visit Bodh Gaya, Sarnath, Kushinagar, Varanasi and Kolkata. 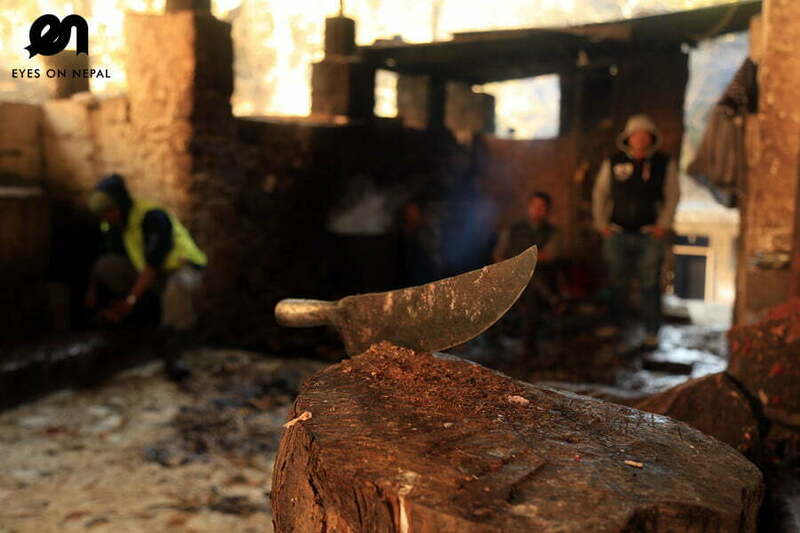 No other tour operators in Nepal run the same tour as Eyes On Nepal. 00.00pm: Visit Kathe Simbu Stupa by walk. NOTE: Our tour guide will take you there by walk. 00.00pm: Back from sightseeing and back to Thamel. NOTE: You can make some shopping and explore Thamel on your own. Highlights: Visit 2 x UNESCO World Heritage Sites + Kopan Monastery + Dinner with Nepalese Cultural Dance Performances. Kopan Monastery – It is the most famous Buddhist monastery in Kathmandu valley. 02.00pm: Lunch at China Town restaurant. 03.00pm: After lunch, back to hotel, rest & relax. Free & easy until pick up for dinner. 06.00pm: Pick up, dinner at Gokarna House Restaurant with Nepalese cultural dance performances. 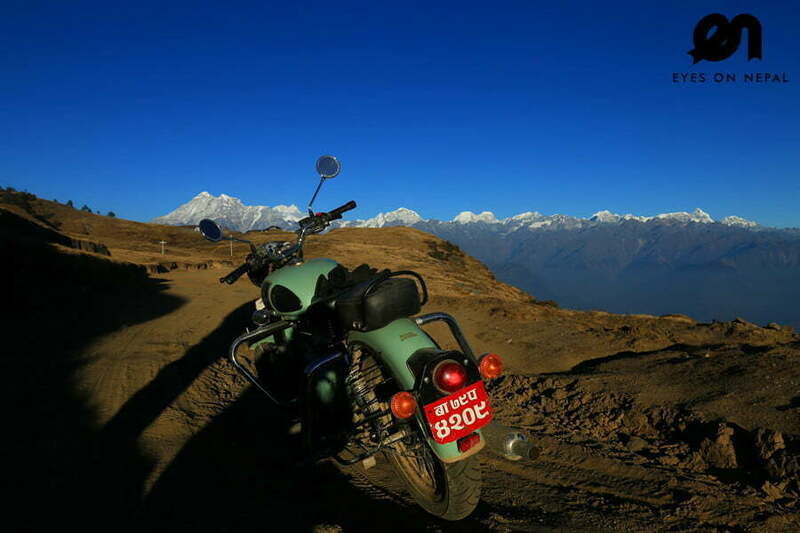 Highlights: Travelling to Pokhara with mountains and rivers as backdrops. Amazing views on the road. 06.00am: Breakfast at hotel. Check out hotel. 07.00am: Pick up from your hotel. Transfer to Pokhara by private vehicle(bus/van/car). NOTE: It may take up to 8 hours to reach Pokhara. 09.30am: Tea break at Highway Restaurant at own expenses. 10.45am: Lunch break at Mugling Restaurant. 11.45am: Continue the drive to Pokhara. 02.00am: Arrive in Pokhara. Check in hotel. Welcome Drinks. Rest and relax. 07.30pm: Pick up from the hotel. Dinner at Lan Hua Restaurant. 08.30pm: After dinner, back to hotel. Rest & relax. OPTIONAL: Travel to Pokhara by domestic flight. Additional charge: USD100.00. You can choose flight instead of van from Kathmandu. It is faster and more comfortable than van. You will be dropped at the Kathmandu Domestic Airport. Our staff will drop you at the departure gate in Kathmandu Domestic Airport. You will have 30 minutes’ flight to Pokhara. During your flight, you will see the amazing view of Mountains like; Langtang, Ganesh Himal, Manaslu, Lamjung Himal, Annapurna and fishtail etc. 10.00am: We will visit Barahi Temple & Phewa Lake. You can do boating on Phewa Lake. NOTE: Expenses at own. 10.55am: Back to hotel. Rest and relax and wait for other friends if they are coming by overland. 05.00am: Pick up from Hotel for sunrise tour to Sarangkot. 05.30am: Arrive at Sarangkot and sunrise view with splendid mountains views. Description: Sarangkot (1592m) is the highest view point for a sunrise in Pokhara. You will reach Sarangkot easily by 30 minutes’ drive from Pokhara and you need 5 minutes hike up to the main view point. You will see the mountain likes; Annapurna I, II, III, Hiunchuli, Fishtail, Manaslu etc. 06.30am: Drive back to Pokhara. 07.00am: Back at hotel. Breakfast at the Hotel. After breakfast, rest and relax. OPTIONAL: Paragliding Tour – Additional charge of USD 100 without photos and videos, USD 120 with photos and videos. Descriptions: You will start your 45 minutes Paragliding tour after a short briefing by the pilot. Pokhara in Nepal is the world’s best paragliding spot in the world with amazing view of Annapurna range of mountains and beautiful landscape around Pokhara valley, virgin Mt; Fishtail (Machhapuchhre), LamjungHimal, AnnapaurnaHimal, Dhaulagiri(The highest mountain in this region, Himchuli, Phewa Lake, Rice field, rivers and settlements. 11.00pm: Back to hotel from Paragliding. 11.30am: Pick up from hotel, lunch in Thakali Kitchen Restaurant. NOTE: Nicest Thakali Dha Bhat in Pokhara according to locals and tourists. Tibetan Refugee Camp & Tibetan Monastery. 07.00pm Pick up from your hotel for dinner at Harbour Cafe. 08.30pm Back to hotel, rest and relax. 06.15am: Morning calls. Wake up. 06.45am: Breakfast at the hotel. 07.15am: Drive to Lumbini (09 hours). 12.30pm: Lunch at Nanglo West Restaurant (Tansen). 01.30pm: Continue the drive to Lumbini. 04.00pm: Arrive at your hotel in Lumbini. Check in. Rest and relax. 06.00pm: Dinner at hotel. After dinner, free and easy time. ** Mayadevi Temple – Birthplace of Lord Buddha. ** Korean Temple and etc…..
11.45am Back to hotel. Lunch en route. Rest and relax. ** Vietnam monastery and etc…..
07.00pm Dinner at the hotel. Rest and relax after dinner. 05.45am: Breakfast at the hotel. 06.30am: Departure to India – Nepal border: Sunauli. 07.15am: Arrive in Nepal – India border. Enter to India after clearance of immigration. 11.45am: Arrive in Kushinagar. Check in one of the monasteries in Kushinagar. 12.45am: Lunch at Yama Cafe. Rest and relax after lunch. 06.00pm Back to hotel, rest and relax. 07.00pm Dinner at the Yama Cafe. After dinner, rest and relax. Highlights: Visit the holiest Hindu city in India. 06.00am: Wake up. Breakfast at hotel. 07.00am: Transfer to Varanasi. NOTE: It is 9 hours journey. 12.00pm: Lunch en route. NOTE: At own expenses. 01.00pm: Continue the journey to Varanasi. 04.00pm: Arrive in Varanasi. Check in Hotel Vibhaha Harsh. Welcome Drinks. Rest and relax. 06.00pm: Visit Ganga’s river bank for the evening Aarti. NOTE: Aarti is a Hindu religious ritual of worship, in which light from wicks soaked in ghee (purified butter) or camphor is offered to one or more deities. 07:30pm: Dinner at the hotel. NOTE: You can visit local market on your own after dinner. NOTE: If we have good weather and arrive on time on Varanasi, we will visit Sarnath on the same day. Highlights: Sarnath (The Deer Park in Sarnath is where Buddha first taught the Dharma) and Bodh Gaya: the Place where Buddha had obtained the enlightenment. 06.00am: Breakfast at the hotel. ** Thai Temple, Japanese Temple, Chinese Temple, Bruma Mandi, Indonesia Temple etc. ** Bodhi Tree and etc …..
09.30am: Transfer to Bodh Gaya. 12.30am: Lunch en route near Sasaram at own expenses. 01:15pm: Continue our journey to Bodh Gaya. 03.15pm: Arrive in Sasaram. It is the third famous city in this area according to the locals. 04.15pm: Arrive in Aurangabadh. Tea break. 04.45pm: Continue the drive to Bodh Gaya. 08.00pm: Dinner at the hotel. Rest and relax after dinner. Highlights: Bodh Gaya: the Place where Buddha had obtained the enlightenment and, visiting different stupas, temples and monasteries. 08.30am: Visit: Sujata Kuti. 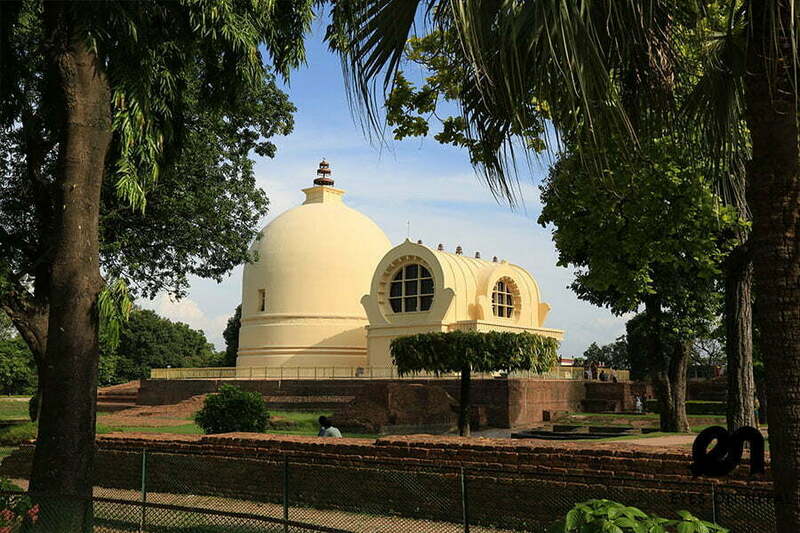 NOTE: It was built in the memory of Sujata (the tribal women who offered kheer to the starving Gautama Buddha, this Kuti is a stupa that stands as a tribute to the woman’s generosity. 09.45am: Breakfast at the hotel. Rest and relax after breakfast. Free and easy time. NOTE: Lunch at own expenses. 06.30pm: Visit Mahabodhi Temple for the evening view. Note: You will have great evening view and you can make meditation inside the Mahabodhi Temple. 08.45pm: Dinner at the hotel. Rest and relax after dinner. Golden Apple Hotel or similar class hotel. Highlights: Visiting India’s oldest city. Beautiful sights and scenery during the journey. Mode of Transportation: We will use train on availability 11 hours or bus journey will take around 11 hours too. 07.00am: Breakfast in the hotel. 08.00am: Check out hotel. Pick up from hotel and proceed to Kolkata directly. The journey on road will take around 11 hours. NOTE: Lunch en route at own expenses. 07.00pm: Arrive in Kolkata. Check in hotel. Rest & relax. NOTE: Dinner at own expenses. Free & easy after check in to hotel. 07.00am: Breakfast at the hotel. Free & easy. NOTE: Lunch at own expenses. Free & easy until transfer to airport at 9.30pm. NOTE: Dinner at own expenses. 00.40pm Depart to your own country. Accommodation in Nepal & India x 11 nights as per itinerary. NOTE: Base on twin sharing. All land transportation in Nepal & India. Nepal to India: Cross countries visa entry handling. Indian Visa. NOTE: Visa on arrival for India is not available. Please apply it at own country before arrival in Nepal and India. Paragliding Tour on day 4, additional USD100 per person without photo & video, USD120 with photos and videos. Domestic Flight from Kathmandu to Pokhara on day 3, additional USD100 per person. International flights arrival in Nepal and departure from India. Flight arrival time in Nepal and departure time from India. 2) We will reply you with an official quotation with itinerary, adjust to your flight details. 7) Welcome to Nepal & India. We will greet you upon your arrival in Nepal airport!